„Die Ortung des Bootes“ war ein Versuch, etwas über die Vorstellungen der BewohnerInnen von Lodsch zu erfahren, die in ihren alltäglichen Abläufen mit dem Trägersymbol, respektive den Identitätsfindungsprozessen, ihrer im Umbruch befindlichen Stadt konfrontiert sind. 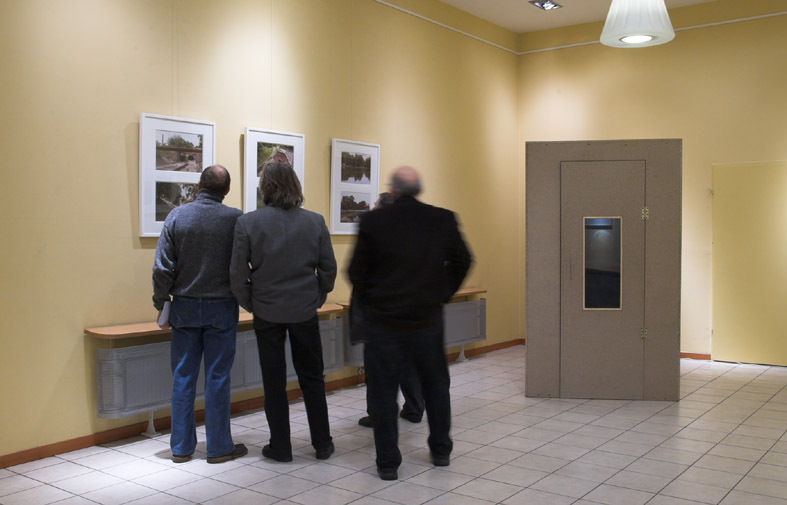 Für die akustische Ortung des Bootes und ihre fotografische Dokumentation baute ich mit Fotoarbeiten aus drei vorangegangenen Projektphasen eine Assoziationskette zu dem von mir postulierten imaginären Lodscher Boot auf. 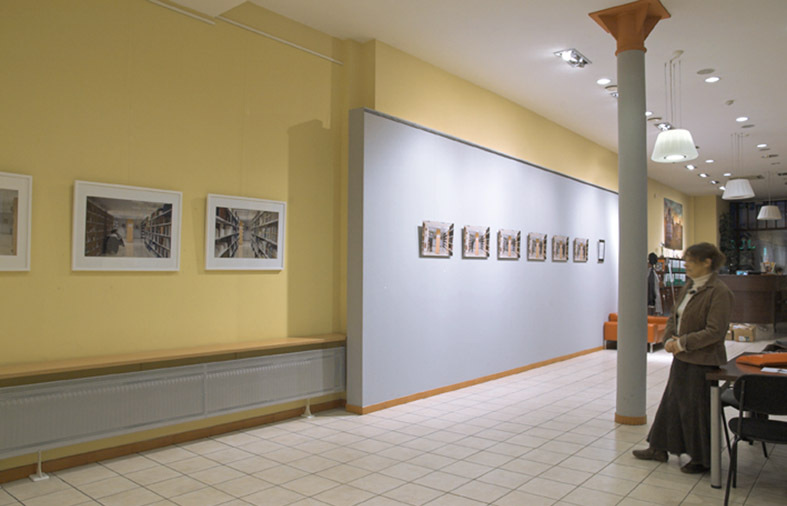 Eine im rückwärtigen Ausstellungsbereich installierte und mit einem Tonaufnahmegerät verbundene Sprecherkabine bildete in dem allgemein betretbaren, mit Identitätsmodellen verdichteten Raum der Stadtverwaltung Lodsch eine neutrale Zone, eine allem Zeitempfinden entzogene Ein-Personen-Insel. 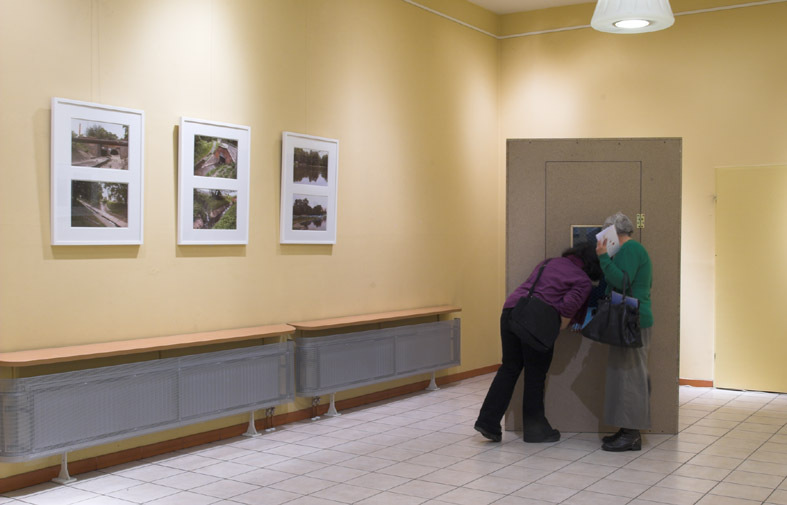 Diese bot den BesucherInnen der Ausstellung und den Angestellten des Hauses die Möglichkeit, die an sie gerichtete Frage „Was würden Sie machen, wenn Sie ein Boot hätten“ zu beantworten. Die schallisolierten Wände der Aufnahmekabine kapselten jeweilige SprecherInnen vom öffentlichen Raum ab. Mit dem Schließen der Kabinentüre traten sie aus dem Lärm der Umwelt in plötzliche Stille. Dabei gerieten sie unversehens zu sich selbst und durch die Fokussierung ihrer Bootvorstellungen in den Raum des imaginären Lodscher Bootes. Durch diesen Vorgang von Imagination und sprachlicher Ausformung füllte sich das unerwartete akustische Vakuum mit den Schallwellen ihres Sprachschalls, mit ihren Vorstellungen und mit dem Geist des imaginären Bootes. “Localizing the boat” was an attempt to get to know something about the visions of the inhabitants of Łódź, who in their daily life are confronted with the symbol, or the identity finding process, of their changing town. For the acoustic localization of the boat and its photographic documentation, by means of photos from the three previous project phases I built an association chain to the imaginary Łódź’s boat I posit for. 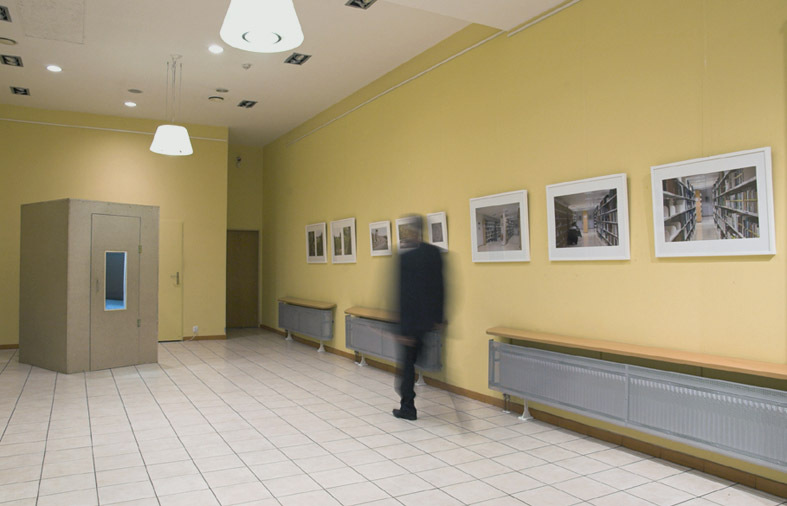 In the back of the exhibition area there was a booth connected with a recording device, which, in the publically accessible, condensed with identity models space of Municipality of Łódź, created a neutral zone, a one person island exempted from any perception of time. It offered the exhibition visitors and the employees of the Municipality the possibility to answer the question “What would you do, if you had a boat?” addressed to them. The acoustic insulated walls of the recording booth shut each speaker off from the public space. By closing the booth door they stepped out of the noise of the environment into sudden silence. Thereby they unexpectedly got into their own selves and, by focusing on the boat visions, into the space of the imaginary Łódź’s boat. By the process of imagination and linguistic formation the unexpected acoustic vacuum has been filled with the sound waves of their speech, with their visions and with the spirit of an imaginary boat.